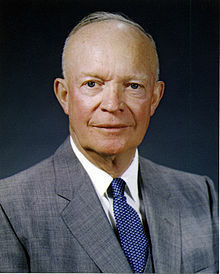 Dwight David "Ike" Eisenhower was the 34th President of the United States from 1953 until 1961. Prior to that he was a five-star general in the United States Army. During World War II, he served as Supreme Commander of the Allied Forces in Europe, with responsibility for planning and supervising the invasion of North Africa in Operation Torch in 1942�43 and the successful invasion of France and Germany in 1944�45, from the Western Front. In 1951, he became the first supreme commander of NATO. A Republican, Eisenhower entered the 1952 presidential race to counter the non-interventionism of Senator Robert A. Taft, and to crusade against "Communism, Korea and corruption." He won by a landslide, defeating Democrat Adlai Stevenson and ending two decades of the New Deal Coalition. In the first year of his presidency Eisenhower deposed the leader of Iran in the 1953 Iranian coup d'etat, and used nuclear threats to conclude the Korean War with China. His New Look policy of nuclear deterrence gave priority to inexpensive nuclear weapons while reducing the funding for the other military forces; the goal was to keep pressure on the Soviet Union and reduce federal deficits. When the Soviets launched Sputnik in 1957 he had to play catchup in the space race. Eisenhower forced Israel, the UK and France to end their invasion of Egypt during the Suez Crisis of 1956. In 1958 he sent 15,000 US troops to Lebanon to prevent the pro-Western government falling to a Nasser-inspired revolution. Near the end of his term, his efforts to set up a summit meeting with the Soviets collapsed because of the U-2 incident when an American spy plane was shot down over Russia and its pilot captured. On the domestic front, he covertly helped remove Joseph McCarthy from power but otherwise left most political activity to his Vice President, Richard Nixon. He was a moderate conservative who continued New Deal agencies, expanded Social Security and launched the Interstate Highway System. Though generally passive on civil rights, he sent federal troops to Little Rock, Arkansas, for the first time since Reconstruction to enforce federal court orders to desegregate public schools, and signed civil rights legislation in 1957 and 1960 to protect the right to vote. He implemented desegregation of the armed forces in two years, and made five appointments to the Supreme Court. He was the first term-limited president in accordance with the 22nd Amendment. Eisenhower's two terms were mainly peaceful, and generally prosperous except for a sharp economic recession in 1958�59. Although public approval for his administration was comparatively low by the end of his term, his reputation improved over time. In recent surveys of historians, Eisenhower is often ranked as one of the top ten U.S. Presidents. He was the last President who was born in the 19th century.